Owain Doull won gold in the scratch race as Britain's track cyclists enjoyed more success on day two of the World Cup in Aguascalientes, Mexico. The Welshman, 20, followed up his team pursuit bronze by beating Hong Kong's King Lok Cheung in the scratch race. Olympic champion Jason Kenny won sprint silver, and double world champion Becky James took bronze in the keirin. 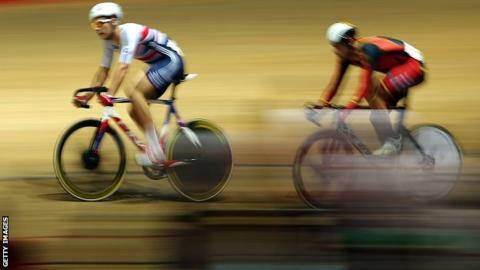 Elinor Barker won individual pursuit silver, while Laura Trott lies second in the omnium. Cardiff's Barker, 19, set a new personal best in the individual pursuit qualifying of three minutes 30.009 seconds, but lost out to Rebecca Wiasak of Australia. Trott, 21, was absent the previous day when Barker teamed up with Dani King, Joanna Rowsell and Katie Archibald to break the women's team pursuit world record twice. Records have tumbled in the high altitude and Kenny, 25, put in a much improved performance in the individual sprint, having lost in qualifying during the previous World Cup in Manchester. France's Francois Pervis set a new world record in qualifying with a time of 9.347, but it was Australian Matthew Glaetzer who denied Kenny gold with a 2-0 win in the final. James, from Abergavenny, came through the keirin repechages to finish behind in-form German Kristina Vogel and Wai Sze Lee of Hong Kong in the final.